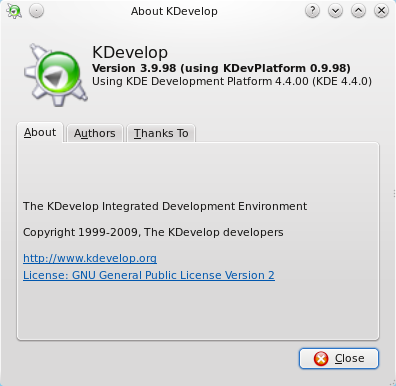 Kdevelop 4 and kdevplatform beta8 .deb packages for Kubuntu Karmic 9.10 (with kde 4.4 from ppa:kubuntu-ppa/backports) are available on my PPA. Mountoid 0.33 is a plasmoid provides a way to mount/unmount devices from fstab (e.g. network shares), show free space and open mount point location in a file manager. It is fully configurable. PHP and PHP Documentation plugins for KDevelop beta2 .deb packages for Kubuntu Jaunty 9.04 and Kubuntu Karmic 9.10 are available on my backports PPA. 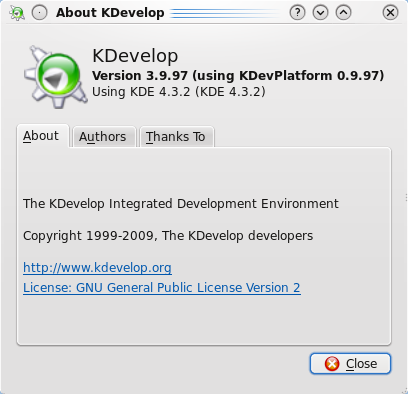 Kdevelop 4 and kdevplatform beta7 .deb packages for Kubuntu Jaunty 9.04 Kubuntu Karmic 9.10 are available on my backports PPA.